Cool image time! 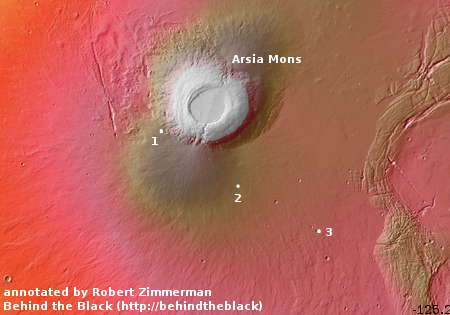 In the November image release from the high resolution camera on Mars Reconnaissance Orbiter (MRO) were three images, dubbed by me in the collage above as number one, number two, and number three, showing pits south of Arsia Mons, the southernmost volcano in the chain of three giant volcanoes to the east of Mars’s largest volcano, Olympus Mons, and to the west of the Marineris Valles valley. The image on the right provides the geographical context of the three pits. They are all south of the volcano on the vast lava flow plains that surround it. The location of pits #1 and #2 is especially intriguing, on the east and west edges of what appears to be a large lava flow that had burst out from the volcano, leaving a large lava field covering a vast area several hundred miles across just to the south. You can also see a similar large lava field to the north of the volcano. Both fields appear to have been formed when lava poured through the breaks created by the fault that cuts through the volcano from the northeast to the southwest. The pits thus appear almost as if they were punched out by a giant shooting a pistol at this relatively smooth plain, creating three giant bullet holes. The lack of other surface features suggest that these are merely holes that go nowhere. The more likely geological expectation however is that these pits are skylights into large lava tube systems. In looking closely at all three images, their shadowed western sides suggests that the pit rims are overhung, and that there might be passage underneath. With the lit eastern rims, pits #2 and #3 both suggest a shadowed area and an overhang to the east. Pit #1 however does not appear to have any passage going to the east. None of this is conclusive. More high resolution images will have to be taken of these pits with the lighting coming from the east to clarify better whether they are undercut and connect to further passages. If these are merely holes, the next question is: What caused them? They do not resemble impact craters, in any way. And a giant shooting a pistol is obviously not a reasonable explanation. I am inclined to believe they are evidence of three underground lava tube systems, making them collapsed skylights into those systems. On Earth it is not unusual for the collapse of a lava tube roof, creating the skylight, to block access to the adjacent passages. This is possibly why in pit #1 the eastern side shows no passage, even though this is likely the upstream side, with lava coming down from the volcano from this direction. 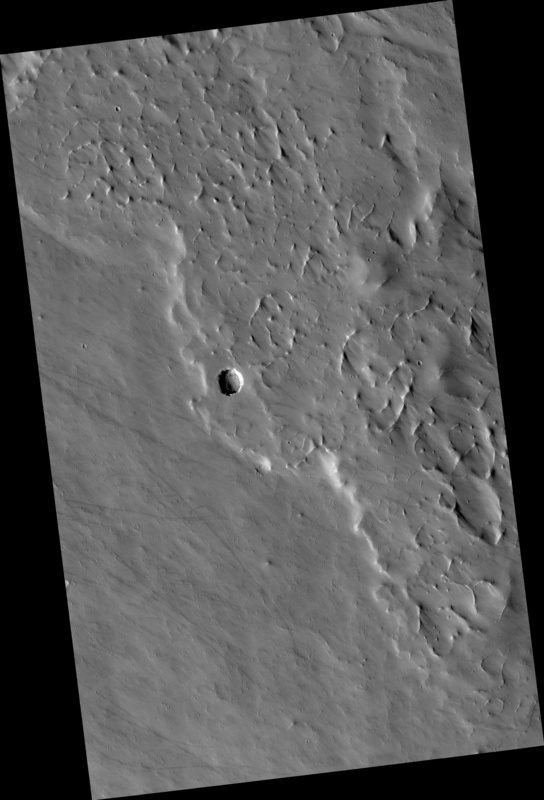 What makes these pits especially intriguing to me is the knowledge that there is evidence of past glacial activity around Arsia Mons, along with the formation of recurrent and seasonal water clouds above the volcano, suggesting the existence of underground ice leftover from those glaciers. These pits might provide an access to that water ice. I see an impact causing lava tubes at the impact site to collapse. Site three looks like a future lave tube city entrance. 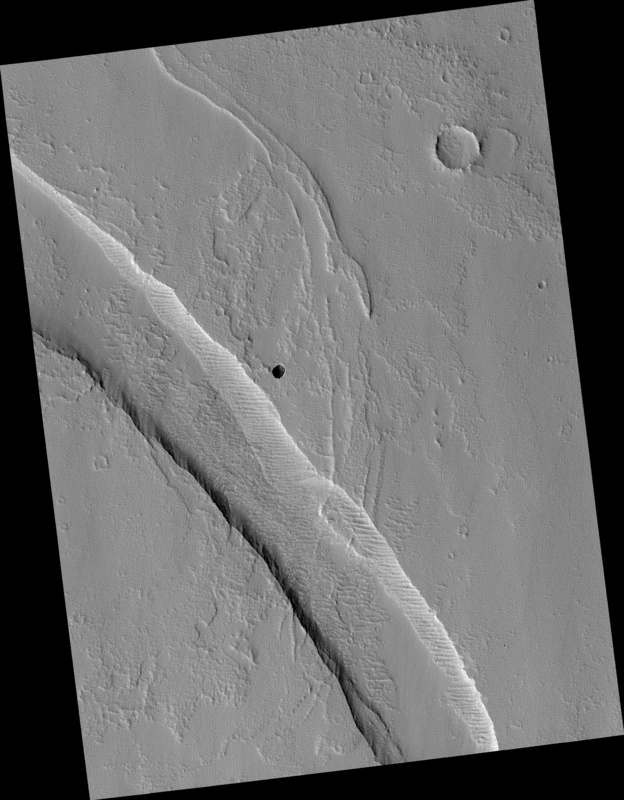 You are right about there being water ice underground near the base of the western flank of Arsia Mons. 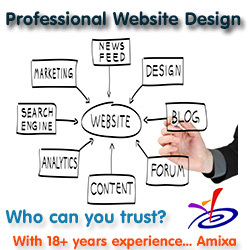 I will share my findings with you if you will contact me by email. Hope to hear from you.